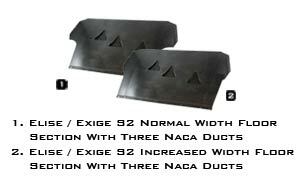 Reverie produces several types of under floor sections which include models with integrated Naca ducts. Under floor sections cover the underside making the vehicle more streamlined. This in turn increases airflow under the car increasing down force. Our under floor sections are designed to be used in conjunction with our rear diffusers.